Being admitted to the hospital for an operation is a scary experience for anyone, but for children it can be especially frightening. Great Ormond Street Hospital in London has installed a unique large-scale project to help distract and soothe children as they are being taken to the operating theater. The interactive installation is called “The Nature Trail” and was designed by Jason Bruges Studio exclusively for the hospital. 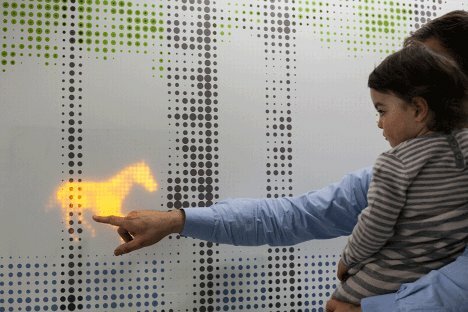 It is both a huge piece of art and an interactive game, all meant to provide young patients with something to focus on other than their impending medical procedures. The work includes 70 huge LED panels and custom-made graphic wallpaper along a 50-meter stretch of hallway. Motion sensors detect patients passing through, causing LED forest animals to appear. 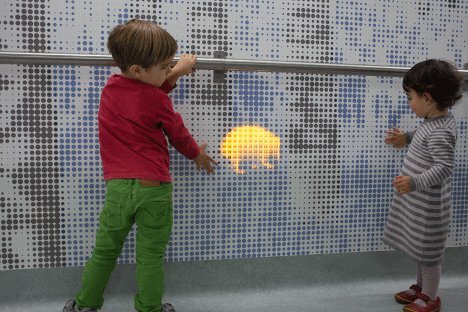 As the patient moves down the hallway, the pixellated LED animals pop up and move around, darting through trees and foliage. For the hospital’s patients, who are all ages 16 and under, this welcome distraction can help make the long trip from their room to the anesthesia room much less stressful. The Nature Trail has proven so popular already that the hospital is planning to expand it to the rest of its walls in the near future. See more in Art of Tech or under Technology. December, 2012.